(a) Install a new gasket after draining engine oil. (a) Remove the 2 bolts, nut and drive belt adjusting bar bracket. (b) Remove the 2 nuts and the generator bracket adjusting bar together with the wire harness clamp bracket. (c) Disconnect the compressor, magnetic clutch connector and wire harness clamp. (a) Remove the 2 bolts and mounting bracket. (a) Remove the 4 nuts and bolt, and disconnect the engine mounting insulator FR. NOTICE: Do not remove the engine mounting insulator. (b) Remove the 4 bolts, nut and engine mounting bracket RH. (a) Using a socket hexagon wrench 10, remove the pivot bolt, timing belt idler No. 1 and plate washer. (a) Remove the bolt and 2 nuts, then remove the oil strainer and the gasket. (a) Uniformly loosen and remove the 15 bolts and 2 nuts, as shown in the illustration. (b) Using a screwdriver, remove the oil pan by prying between the cylinder block and the oil pan. NOTICE: Be careful not to damage the contact surfaces of the oil pan and cylinder block. (a) Remove the 9 bolts. 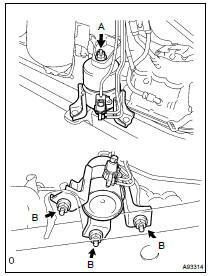 (b) Using a screwdriver, remove the oil pump by prying between the oil pump and the main bearing cap. (a) Using SST and a hammer, install a new oil seal. Tap the surface of the SST with the hammer until the oil seal's surface is flush with the oil pump body edge. Be careful not to tap the oil seal at an angle. Keep the gap between the oil pump body edge and the oil seal free from contamination. (b) Apply a small amount of MP grease to the oil seal lip. (c) Remove any old seal packing material from the contact surface. (d) Apply a light coat of engine oil to a new O-ring and place it on the cylinder block. (e) Apply a continuous bead of seal packing (seal width: 2 to 3 mm (0.08 to 0.12 in.)) as shown in the illustration. Remove any oil from contact surface. Apply seal packing to the inner side of the bolt holes. 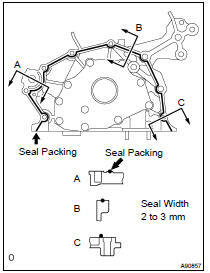 Install the oil pump within 3 minutes after applying seal packing. Do not expose the seal to engine oil for at least 2 hours after installing the oil pump. (f) Align the key of the oil pump drive gear with the key way located on the crankshaft, and slide the oil pump into place. (g) Install the oil pump by tightening the 9 bolts uniformly. (a) Install a new gasket and the oil strainer with the bolt and 2 nuts. (a) Using a socket hexagon wrench 10, install the plate washer and timing belt idler No. 1 with the pivot bolt. (a) Visually check for cracks and breaks on the gasket of the timing belt cover. If there is a trace that water is entering at the visual check, replace the timing belt cover. (b) Install the timing belt cover. (a) Install the engine mounting bracket RH with the 4 bolts and nut. (b) Install the engine mounting insulator RH with the 4 nuts. HINT: First, loosely install the nut labeled (A) with your hand. Then use a wrench to install the 3 nuts labeled (B). Finally, use a wrench to tighten nut (A). (c) Install the engine mounting insulator FR with the nut. (a) Install the compressor with the 3 bolts. Torque: 25 NVm (255 kgfVcm, 18 ftVlbf) (b) Install the adjusting bar bracket with the bolt and nut. (a) Install the control rod and bracket with the 4 bolts.